You wanna get organized, but mom life can be seriously overwhelming. Like “how am I going to get through today” kind of overwhelming. There are a million problems coming at you at once while you’re just trying to keep everyone alive. After 4 back-to-back pregnancies and 4 years of continuous change, I found myself with 4 little girls 4 and under. Our natural state was chaos. I was just trying to get to the end of each day without a trip to the ER or having locked myself in the bathroom sobbing (and nursing a baby–always nursing a baby) with little fists pounding on the door. Everything was just too much. The yelling was too much. The messes covering every surface of my house were too much. My exhausting and feelings of overwhelm and inadequacy–too much. Every night was dragging myself to bed after an insanely chaotic and long day, only to be woken by hungry cries shortly after finally dozing off. There had to be a way out of this mom overwhelm and I was going to find it. I started making small changes, one after the other. And like the morning sun slowly rising behind the mountaintops, my life became progressively lighter and brighter. I started to really take care of my health and get organized. I was happier and more patient. And I yelled less. Small changes over time create a massive impact. Ditching mom overwhelm and getting organized happens as you take the small steps towards a happier, healthier, more orderly life. Here are the steps you can take to say “goodbye” to overwhelm and “hello” to peace, health, & happiness. We all do it at some point. We make excuses for why we aren’t getting enough sleeping, exercising, or eating right. I certainly did. But the truth is that our personal health is the foundation of our lives. If our health is not a priority, we will NEVER have the life we want. Motherhood puts a lot of stress on the body. First, we’re pregnant. Then the baby leaves the body (which majorly stresses the body). After which we spend years carrying kids around, nursing babies, waking several time a night. We’re constantly pushing, wiping, and lifting. And occasionally running to stop a child with a death wish. As moms, our bodies are the most important tools that we have. Regardless of the state of your body right now, your body is a miracle. It is a miracle for all it does for you and all it does for your family. Treating your body kindly is the first thing you should do if you are experiencing mom overwhelm. So many moms put their needs last, afraid to take care of themselves thinking it will take away from their kids. But it’s not a win-lose game where if you are focusing on yourself, your kids are missing out. It’s actually the opposite: The better care you give yourself, the better equipped you are to take care of your family. You can’t give your kids your best when you are running on empty and about to lose it. Your sleep is at the foundation of your health. The current research on sleep is terrifying for us sleep deprived moms: sleep deprivation leads to disease and a shortened life span. But I know what you’re thinking: I’ve got a baby so how on earth can I get enough sleep? going through a relaxing wind down ritual in the hour before bedtime (therefore increasing the quality of my sleep). To have more time you need more sleep. Check out these awesome strategies to get better sleep and conquer mom overwhelm. Oh glorious exercise! My favorite mood booster. And did you know that regular exercise will actually give you more energy in your day? And help you sleep better? Not to mention, exercise is going to make your job as a mom easier. Easier to keep up with your kids, carry them around, push them in carts through gigantic box stores. If regular exercise is a struggle for you, you are so not alone. It’s legitimately tough. But the benefits will change your life. Check out these 7 tips to fit exercise into your busy morning routine. They’re awesome! So often we have this “less” mentality when it comes to eating. We need to eat less. Less junk food. Less sugar. How’s that worked out for us? It usually makes us think in restrictive terms which often leads to sabotaging ourselves or unhealthy mindsets. In my case, restriction leads to me alone in my car stuffing my face with donuts (and I don’t even like them). If you are looking to improve your eating habits, I highly recommend the book Food: What the Heck Should I Eat. Written by nutrition expert Dr. Mark Hyman, it’s extremely helpful for navigating all the conflicting information we are getting about food (like eggs–are they good or bad?). He goes through all the research and will leave you feeling very knowledgable and ready to take control of your health. The author Anthony Trollope once said: A small daily task, if it be really daily, will beat the labors of a spasmodic Hercules. Oh man, I love that quote. Why? Because it is 100% true. Especially when it comes to cleaning and maintaining a home. Instead of the occasional massive and monumental burst of effort, try creating small daily cleaning rituals that will keep you organized, save time, and help you create a home you love. Here are some easy ways to do just that. A little laundry everyday will ensure that it never gets out of control. Think about it: in fifteen minutes, you can throw in a load of laundry and fold the laundry from your load the day before. If you do this every day, you will stay up on laundry. I’ve had very skeptical friends try this and they have been amazed at just how easy and effective this is. You’ll save so much time. This has absolutely changed my life. As a mother of 4, laundry plagued my life. Especially folding. Ugh. I would do one big push a week, gathering, sorting, washing. It was a massive undertaking. And I could never manage to get much folded. Which meant living out of the clean laundry baskets (a time-sucking habit). But now, I fit my “laundry 15” into my regular morning routine of taking care of kids and cleaning up after breakfast. I spend far less time on it, yet it never gets out of control. This is simple: If a task will take only 1 minute or less to complete, do it right away. Whether it’s putting something away, responding to a text, throwing away junk mail, or clearing off the counter. If it takes less than a minute, do it immediately. This gives you 2 boosts: you get the satisfaction of getting something done plus it creates momentum to accomplish more tasks. And it keeps small tasks from building up and becoming overwhelming. When you have huge messes to clean and no time (i.e. every moment of your life), this strategy is perfect. Especially when you’ve just put the kids down for bed. Muster whatever strength you have for just 10 minutes and do a whirlwind clean. It’s amazing what you can accomplish in 10 minutes of focused effort. It’s usually enough to get areas of your house in good enough shape to feel fine moving on to an essential task or going to bed. How you spend your morning often determines the whole trajectory of your day. A crazy and stressful morning usually bleeds into a crazy and stressful day. On the other hand, a productive and energizing morning will set you up for the kind of day you want to have. 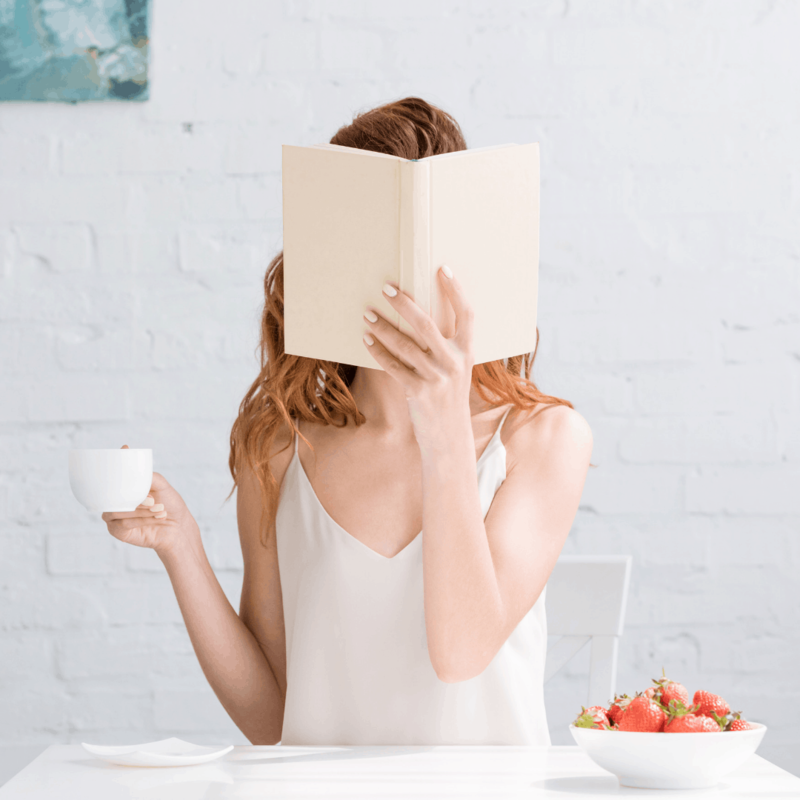 If you want to begin creating a simple, yet powerful morning routine, check out the free 5-day Morning Makeover email challenge. Over the course of 5 days, you’ll create a quick morning routine that’ll set up your day for success. Waking up before your kids will supercharge your productivity and give you important “me time” when you are energized. Even if it’s just enough time to get dressed, brush your teeth, and plan your day. Waking up before your kids puts you in control of your day from the beginning. Waking up to children demanding breakfast means starting your day 2 steps behind. I find that waking up early, exercising, and getting a few thing done before my kids are awake honestly makes me feel like there are more hours in the day. And trust me, I am no natural morning person. Check out these 9 fail-proof tips to wake-up early. If you’re skeptical of this one, I get it. I used to think making my bed was the biggest waste of time. That is, until I actually gave it a shot. Now I’m a full believer in the power of making your bed everyday. Making your bed right when you wake up gives you and immediate and visible “win” for the day. You get a little jolt of happiness/and or feeling of accomplishment. Starting your day with an easy win, sets you up to start knocking more tasks out of your way. You can do anything, but you can’t do everything. This is especially true for moms. You’ve got a million things coming at you at once and little people to keep alive. So how can you manage your home, family, AND prioritize your health? At the start of your day, you’ve got to determine what the most important things you can accomplish today. Where will your focus be? The key is to decide, right off the bat, what are the few things that you want accomplish for the day. Then you don’t let the little challenges that inevitably come derail your day. For example, if my goals are to be an attentive mom and to get some meal prepping done, then a dirty house or an unexpected phone call wont throw me off. When my child slips and falls, I’ll snuggle her and ignore my messy house. When someone calls to chat, I’ll find a way keep it short and get back to making meals. Showering and getting dressed for the day will make you more productive and help you get organized. I’m not sure how, I just know it really works! Mind you, “dressed for the day” does not mean you need to be ready for an Instagram lifestyle shot. It means you are clean, clothed (no pajamas), and have brushed your teeth. Figure out what kind of daily “uniform” is easy to throw on. but makes you feel “ready”. By the way, this shouldn’t take more than 15 minutes. Remember, dry shampoo is your best friend. While living in survival mode is part and parcel of being a mom sometimes, it should always be temporary. By taking control of your health, breaking up cleaning tasks, and taking mornings for yourself you can ditch mom overwhelm., get organized, and create the life you love.